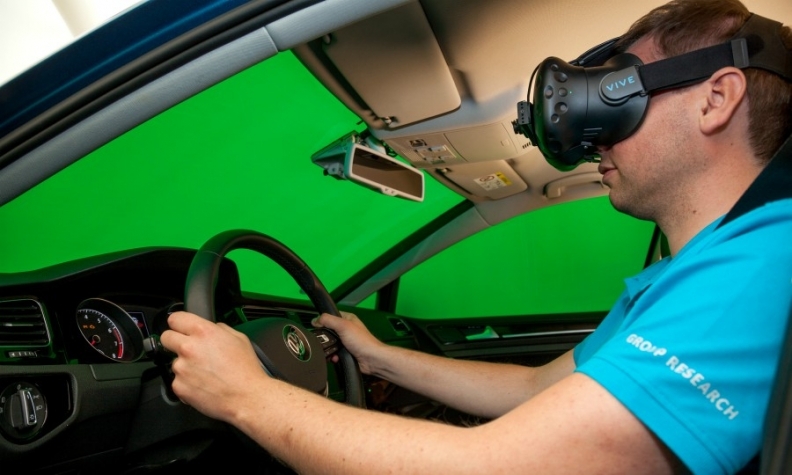 A VW researcher uses virtual reality to test the handover of control of a self-driving car in Chinese traffic. It takes about a half hour driving north from Wolfsburg along a lonely stretch of route A300 to reach Ehra-Lessien, Germany. It's a speck on the map. There's nothing around for miles. Well, almost nothing. After passing through a dense forest, a clearing opens to reveal Volkswagen's secretive proving grounds. Signs at the front gate tells visitors "radio transmissions are monitored" and warns about an infestation by poisonous caterpillars. While home to a small staff, Ehra-Lessien is best known as the site where a select group of Volkswagen's top global executives spend three days annually taking part in coveted, classified test-drives. Once inside, the center resembles Q's workshop from the James Bond movies. VW's brightest minds are working on solutions to the industry's most daunting challenges and it was here that the group's Sedric concept car, a futuristic self-driving pod, was born. Automotive News Europe, along with a handful of other publications, was given a rare glimpse inside this r&d mecca. Escorted to the main building, the Scirocco Hall, we are shown prototypes grouped into the three major megatrends of electric vehicles, autonomous driving and shared mobility. "It was not an easy decision to invite you here," VW Group r&d boss Ulrich Eichhorn told reporters. Even VW employees have their mobile phones confiscated. "But the board decided that in the spirit of openness, we would show you some of the things that normally would stay secret for another two to five years." Since much of the work done involves projects nowhere near commercialization, every brand is required by the group to fund the research with a fixed amount determined according to the same formula. "Each of them gets back research results worth at least twice the amount of money that they put in, and some up to six times," Eichhorn said. Below is a sampling of what we saw -- and in some cases drove. New materials for lightweight construction such as injection-molded shielding for a cylinder head made from durable phenol resins that reduce the weight of an engine block by 13 percent. Next-generation headlights that use Liquid Crystal on Silicone (LCoS) to brighten the surrounding darkness so precisely that arrows could be cast onto the pavement, pointing the way for a driver. No amount of LED elements could have projected images onto a screen with the same level of contrast and sharpness. In a cooperation with Dutch power grid operator Tennet, VW is testing whether light sensitivity sensors can transform cars into mobile weather stations, helping better predict how much photovoltaic energy will be fed into the system, which could help Tennet save tens of millions of euros. An Audi A7 Sportback h-tron quattro that combines both a fuel cell and plug-in hybrid powertrain into one all-wheel-drive vehicle capable of a top speed of 180 kph. At another station, we watched a mobile robot from German supplier Kuka that can charge electric cars without human intervention. Lightweight plastics that offer the same rigidity as glass fiber weaves. Scientists showed us their efforts in predictive analytics to judge how to best manage a mobility service, while other experts explained how they are teaching Nvidia's advanced Drive PX 2 supercomputer to speed up imagery recognition for off-road vehicles navigating through treacherous terrain. Fuel cell cars that integrated a high-voltage battery to give the car a boost. Most impressive, however, was a car named "Dieter" that uses machine learning to adapt itself to changing surface conditions, ensuring safety and stability even at top speeds. "We have to prove that we can control the car at all times even in the most extreme cases," one developer said. Being in the car felt like a roller coaster ride because of the sudden, violent lurches in one direction or another. These were just a few of the projects that Volkswagen deemed less competitive. While impressive, the experience highlighted the dilemma facing the industry. Whether they try to set new standards or just keep pace with the megatrends, automakers cannot slow down for a minute. Therefore, it is easy to understand why VW spends more on r&d than any other company in the world.